The European Central Bank (ECB) has unveiled (17th September) their two remaining denominations that will undergo an update in terms of design and security features. 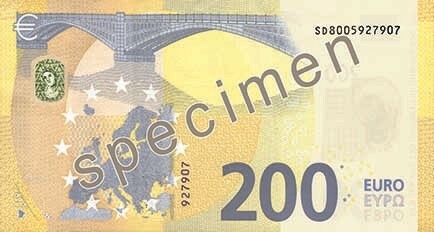 Begun in 2013 with the €5 banknote, the ECB introduced the new “Europa” series which updated the designs that were in use since the first euro-denominated banknotes entitled “Ages and Styles,” designed by Robert Kalina, that went into circulation on the 1st January 2002. Unveiled by Executive Board Member Yves Mersch in the Central Bank’s press office auditorium in Frankfurt, the new €100 and €200 denominations are the last values that will undergo an update and were launched to an awaiting news media. Following the €5, €10, €20 and €50, the launch of the €100 and €200 banknotes marks the completion of the updated Europa series and will enter circulation on the 28th May 2019. The European Central Bank announced on the 16th May 2016, that they would no longer issue or produce the €500 denomination, and, as a result, the note would not undergo an update. The Ages and Styles theme of the first series has been continued in the Europa series, but has been given a fresh look and stronger colours by the Berlin-based independent banknote designer, Reinhold Gerstetter. He has created visual elements that are more rounded and bridges that are more three-dimensional. These changes make all of the notes included in the ECB’s second series easy to distinguish from the first series. The Europa series also includes security features that are even more difficult to counterfeit than those of the first series. 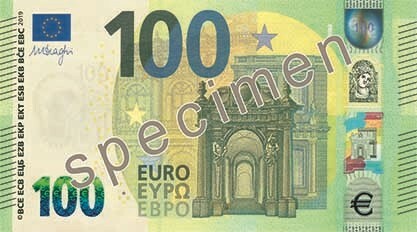 The two new 2019-dated notes retain their trademark colours of green for the €100 and yellow for the €200 denomination, but one significant change for these notes is that they will now be a different size. Both denominations are now the same height as the €50 banknote, with their length remaining unchanged — the longer the note, the higher the value. Since the €50, €100, and €200 banknotes are now the same height, this alteration means they can be more easily handled and processed by machines. They will also fit better in people’s wallets and last longer, as they will be subject to less wear and tear. The signature of both banknotes will include that of ECB President Mario Draghi, in office since 2011, and whose term is to expire in November 2019. The new €100 and €200 banknotes make use of new and innovative security features. Just like the other denominations, these new notes are easy to check when using the “feel, look, and tilt” method first introduced with the earlier euro banknote series. At the top of the silvery stripe is a satellite hologram which shows small euro symbols that move around the note’s numeric value and become clearer under direct light. The silvery stripe also shows the portrait of Europa, the architectural motif and a large euro symbol. 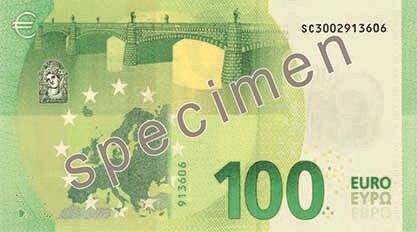 The new €100 and €200 banknotes also feature an enhanced emerald number which can be seen to the lower left on the front side of the notes. While the emerald number itself is present on all the other notes of the Europa series, this enhanced version also shows euro symbols inside the numerals. In addition to the security features that can be seen by an ordinary glance, the euro banknotes also contain machine-readable security features. On the new €100 and €200 banknotes, these features have been enhanced and new ones have been added to enable the notes to be processed and authenticated swiftly. 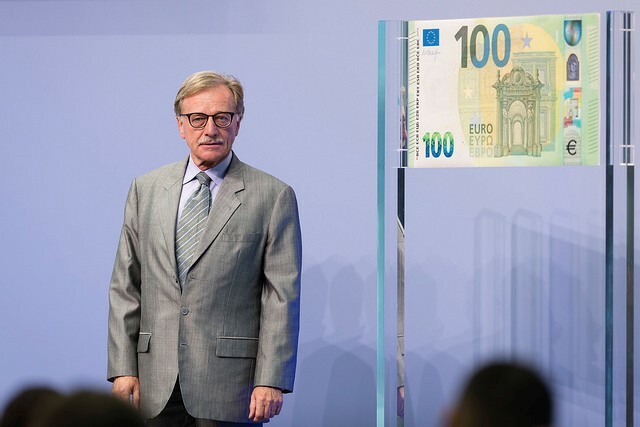 As Executive Board Member Yves Mersch highlighted in his speech unveiling the new banknotes, with the changeover to the new €100 and €200 notes, the entire set of euro banknotes will continue to offer strong protection against counterfeiting. This makes euro banknotes even more secure, but also easier to check and handle. €100: Green. 147 by 77 millimetres. 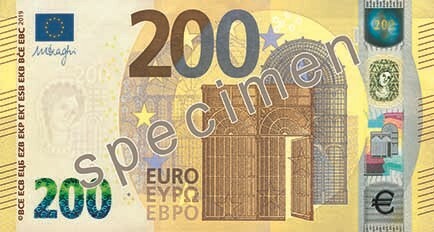 €200: Yellow-brown. 153 by 77 millimetres. The Europa series of euro banknotes is presently in use in the 19 countries of the euro area. The introduction of the €100 and €200 banknotes completes the Europa series, the second series of euro banknotes, and will come into circulation on the 28 May 2019, throughout the euro-zone simultaneously. For more information about this series of euro banknotes, please visit the website of the European Central Bank.